Disclosure: I received these diapers free for review. All opinions remain my own. 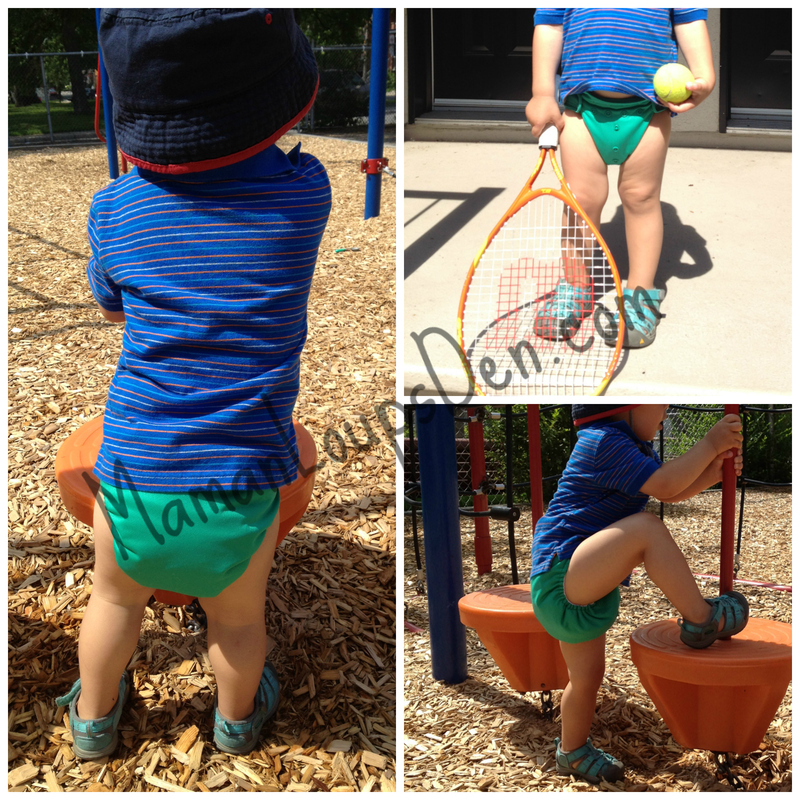 I am a huge proponent of the BumGenius 4.0 Pocket Diaper. I find it to be almost universally suitable from about 12-13 lbs upwards. They are extremely durable diapers, as I have some bought second-hand that are still in excellent condition. They’re super user friendly, and their stretchy tabs set them apart from other brands, allowing for more adjustment at the waist. A pocket diaper has many benefits, including the ability to customize absorption by putting more or less in the pocket, and being able to double as swim diaper if you use it without inserts or even as a diaper cover if you want to use inserts placed on top of the pocket (inserts that can touch baby’s skin, so either bamboo, hemp or cotton) and just swap the soiled insert out and reuse the pocket shell. Pocket diapers have drawbacks, as well. Namely, they’re a multiple-piece system. When laundry’s done, you have to put the diapers back together again. Before putting the diaper in the pail, you have to pull out the wet inserts. As you can see, they look quite similar to the 4.0, in the middle. They both have the stretchy tabs, and the rise snaps and waist snaps have identical placement. All three styles come in the sames prints and colours, and all are also available in aplix closure. The cut of the Elemental is noticeable larger than the Freetime and the 4.0. 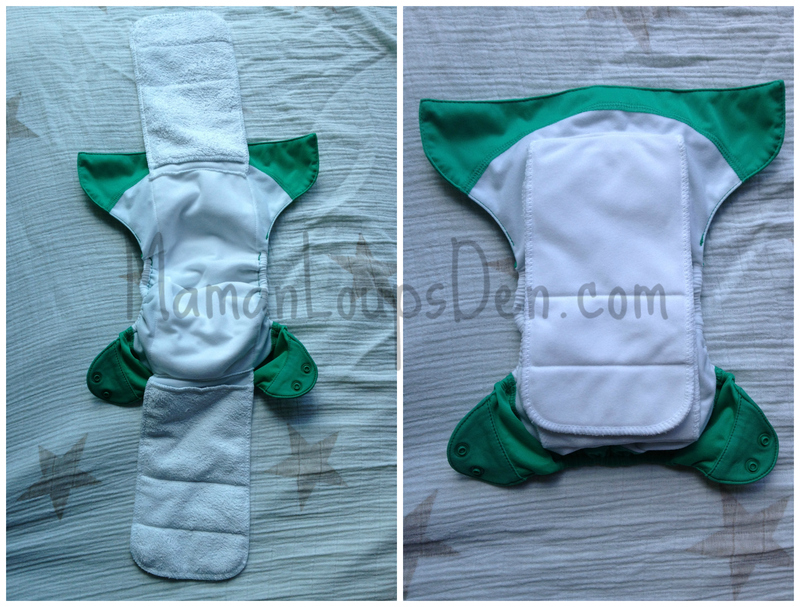 The inside of a BumGenius Freetime contains two microfibre inserts sewn in at the top and bottom of the diaper. These inserts are topped with the same microsuede, stay-dry fabric as a 4.0 pocket, and there is also a layer of microsuede sewn directly to the PUL, underneath the two inserts. The Freetime is really the “one piece” equivalent of the 4.0. The same fibers are used and the fit is fairly similar. I’m a fan of the Freetime because I’m such a fan of the 4.0. I like that it’s got the stay-dry inner and that the fit mimics the 4.0. My primary concern with this diaper is that both inserts are sewn in. I think that if Cub were wearing the diaper on a lower rise, I would like the option of removing one of the inserts for less bulk. 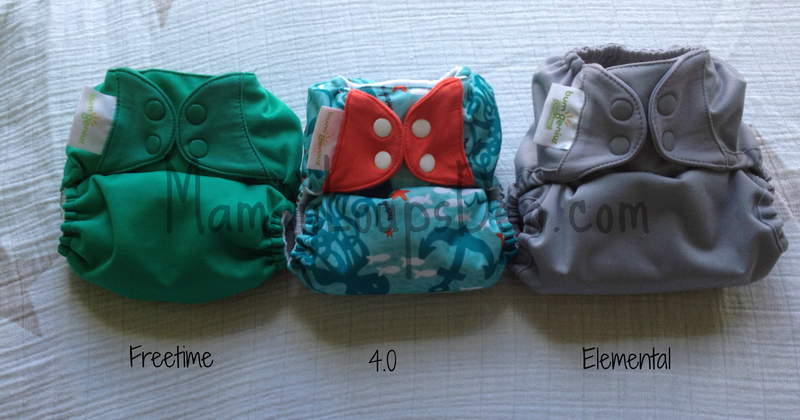 The Elemental is the “all-in-one” cousin of BumGenius’s “Flip” diaper system, which is a PUL cover that you can choose to pair with an organic cotton insert. But rather than being removable, the insert in the Elemental is sewn in place, of course. You can see from the images above that 4.0s, Elementals and Freetimes are cut very similar. However, the Elemental is slightly wider at the crotch than the 4.0 and Freetime. Because of the nature of their inserts, Elementals and Freetimes do fit differently on Cub. They both, however, fit very well. That said, I suspect that parents using either one of these styles on a smaller baby (Cub is about 30 lbs) may find the fit rather bulky. Since you cannot remove any of the absorbent parts of the diapers (which, to be fair, is what makes them truly “one piece”), the inserts need to be folded up in order to fit inside on a lower rise. Many AIO diapers have one insert that can be snapped in or out, which I think is an advantage when using them on smaller babies. Once you’ve decided you want to use all-in-one diapers over other styles, the choice between the Freetime and the Elemental, in my opinion, comes down to whether or not you want the “stay dry” layer against baby’s bum or you prefer organic cotton. Some babies are allergic to the microsuede inners of Freetimes and 4.0s, so that would make the Elemental the obvious choice. Others are very sensitive to moisture against their skin, in which case, Freetimes would be the better option since cotton feels very wet to the touch. Both models can be easily “boosted” if need be, simply by adding a booster of your choice either on top of our underneath the sewn-in inserts. Which BumGenius style is your favourite? I’ve never tried an elemental but we love our freetimes! Perfect night diapers for my little one! I would like to try the freetime diaper, we love our 4.0’s. I have only tried the 4.0 and flip. I love them!! I’m a huge fan of the freetime – that and tots bots are my favourites. I’d like to try the elemental too though. I’ve never used either. I think the Elemental is more appealing to me just for the natural fibres. I haven’t used either. I like the idea of the cotton but I like a tighter fit so it’s a toss up. I would prefer an elemental since it’s natural fibers. I may try the elemental but my BFF recommends the free time. It’s a toss up. Je suis vendue aux Freetime!!! I like the 4.0 the best but I’m a pocket diaper girl. I would love to try an elemental. I love my 4.0s, & would like to try a freetime! I would like a Freetime. We have one and it’s my FAVORITE diaper. So easy and I love how I can choose where I want the most absorbency. I love the couple freetime diapers that we have at the moment. I would love to up my stash with a few more. I would get the Freetime. I think based on your review I would go with the Freetime! Thanks for such a great review! I love freetimes but have yet to try an elemental. I love the 4.0’s – stuff em with whatever you want, quick to dry and fit LO at 10 pounds. What’s not to love? Love my 4.0s! With baby no 2 on the way and the first still in diapers my stash needs to expand! I love my 4.0s but I’d love to try a Freetime! I love my freetimes so I would choose that! I’m torn on this one. DD is sensitive to moisture, so the stay-dry of the Freetime would be good to have, but I don’t trust microfiber very much. I think I’d be interested in trying the Elemental. I Love the article, personally the freetimes are my favorite and fit my petit twins the best! I would love to win a freetime. I tried the elemental and my daughter didn’t like the wet feeling! Would love to win a Freetime! I would love an elemental. Love BumGenius! Based on your review, I think the Freetime would work better for our family. I’m a huge fan of Freetimes, I have over 20. Love them!! I have not tried either but would prefer the freetime I think. I’d like to try a Freetime. I would love to try a Freetime – something different than what I already have! I’d try a Freetime. I only have 4.0s. I have not tried either. I have some Flip covers though. I would love to try either AIO. I have never used an new elemental but I have 1 old style elemental and I prefer my freetimes for sure. I don’t dislike the elemental, just love the freetimes! I like natural fibers, so I would choose the elemental. I’d love to try the freetime! I might prefer the freetime though. I can’t decide which I would rather try. 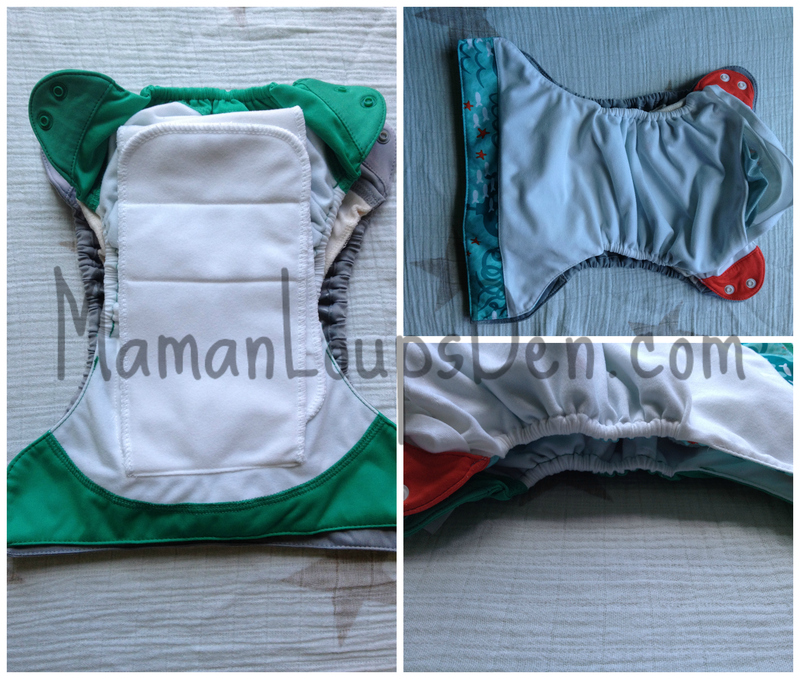 We are new to cloth diapering, or any diapering as our first is on her way. We want to try a variety to see what we like so either would be great to start! I would pick Elemental. I like the idea of the organic fabric. I’d pick the elemental. 1. i like the name better 🙂 2. I dislike microfiber. 3. I have a freetime that i’m not a huge fan of. The Freetime, I prefer a trimmer fitting diaper. this is so helpful, i have been wondering the differences. thanks! I will be new to cloth diapering in January, so I’m not sure which would be best. 😀 Would love to have your suggestion if I win! I like the freetime best one of the best diapers i ever used! I have some freetimes and I hate spraying them. I’d choose elementals because I like that they are cotton and I like that they don’t have flaps that when attached to the spray pal will flip into the toilet. Thank you for the opportunity! I have both types and like the free time much better. I use both for night time and really haven’t had any leaks with either! Good comparison. I love my 4.0s and have been using flip covers with flats a lot lately. I think the appeal is allowing my toddler to feel wet as a part of our elim comm. I’ve never used bg’s Elemental. I am not a fan of Freetimes simply because of microfiber (laundry issues I didn’t have the desire to solve). This makes me want to try an Elemental! I love my 4.0s! It’s the system a started with and it’s simple. I save more money by having my lo wear one diaper multiple times in the day and switching out the inserts- another disadvantage if I had AIOs. Just my thoughts as a ftm. I’m confused! You use your microfiber inserts in your BumGenius pockets and switch them out without changing the cover? I’ve tried both and although I love the idea of organic cotton, I choose the Freetimes for faster drying time, easier to clean and better fit.